Fatvat: The Game of Life in Clojure. 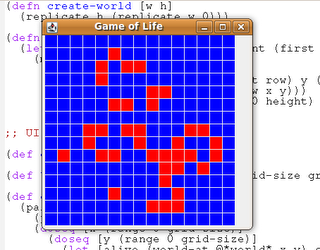 Conway's Game of Life is by far the most famous example of cellular automaton. It's not really a game, you set an initial state and then watch it evolve. Any live cell with fewer than two live neighbours dies, as if by needs caused by under-population. Any tile with exactly three live neighbours cells will be populated with a living cell. Now we need some helper functions for getting the state of an individual element and toggling values. toggle-row-at and toggle-pos both feel wrong to me - I'm not sure of a better way to carry position information into a map function (for example, I want to perform a map operation with positional information - zip is the only way I can see of doing that - wonder if there is a better way?). Armed with functions to explore the world we need to write the logic to transition from one-state to the next. In order to implement the GUI around this, we define *world* as an atom, and provide a mouse listener which on a left-click toggles elements, and on a right-click moves forward one step. Animating it would be fairly simple too (just hook up a Swing timer a la bubble sort). While writing a little tile based platformer test game I came across similar issues with storing grid data and position. I ended up using a sorted map with the keys being vectors containing the coordinates and the values being whatever data you need so that [x y] => cell data. This made it easy to update a cell (well reduce the grid in my case) based on the values of its neighbours. As it was sorted, I could still iterate through the cells as needed. Another advantage for this approach for me was that it works out well for sparse data grids. Not sure if this is much of an improvement for your purposes, but it at least is another option. Thanks Matt - that does sound like a better way of doing it. Zip is ugly because I have to rebuild the co-ordinate to value mapping each time and, as you suggest, it isn't going to work with sparse grids. I'll have a look at refactoring the map representation and see what difference it makes to the shape of the code!